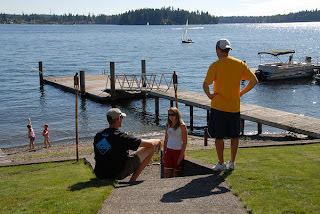 Our first annual Durrfest 2007 on Labor Day weekend was really fun. We had two separate parties - one for friends and one for family. This will definitely be a tradition. Thanks everyone who came and made things fun and easy! We had about 40 people at each party. 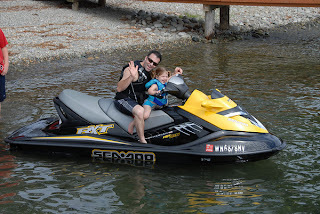 Ross and Elena on Uncle Tim's Sea Doo. 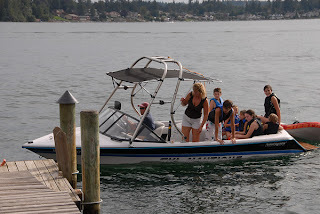 Everyone out on the boat! Jeremy & Emma. 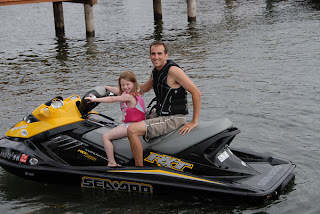 Emma had her first experience on a Sea Doo, and the crazy kid drove it at 67 MPH. Steph, Max & Kerry chatting at the friend Durrfest. Did I say Durrfest? I mean babyfest. There were over 15 kids age 2 and under. There were oodles of new babies. This is (from left to right) Becca, Annie & Shelby, Jodi & Abigail, Kelly & Elsa. 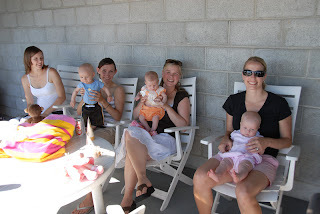 Our living room was the feeding/nursing room for all the babies.